We did it, we’re back home in Victoria BC! To everybody who joined us yesterday, either in Sidney, for the electric car convoy downtown, and/or at Mile Zero in Victoria: Thank you so very much! It meant a lot to us that you took the time to come out and welcome us home! It was a great trip, an unforgettable experience, but it feels good to be home again! Being home doesn’t mean we’re done, though! 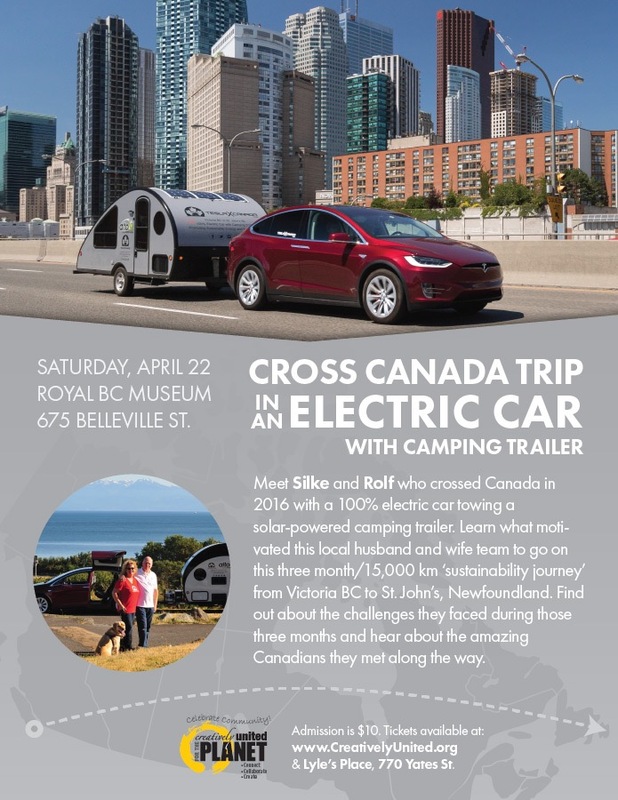 Join us for our first presentation about our cross Canada trip in an electric car with camping trailer at the Sustainability Showcase on April 22 right here in Victoria BC! 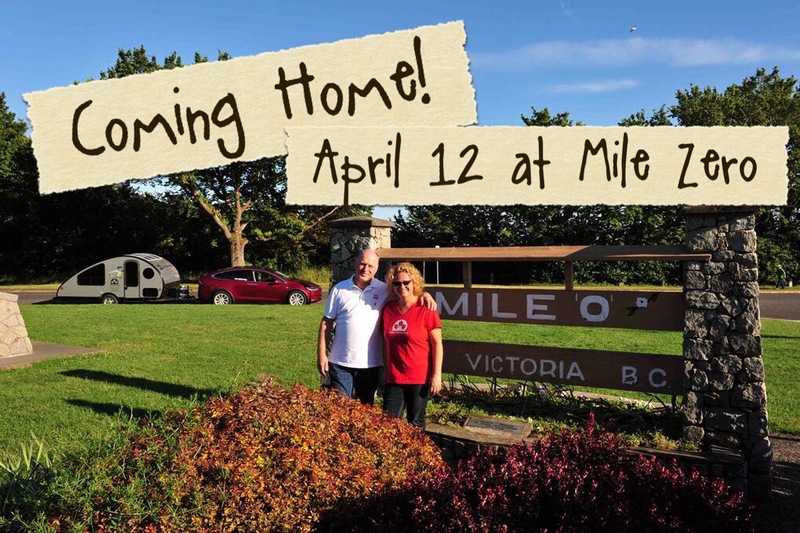 On Wednesday, April 12, Rolf, Kye and I (Silke), aka TeslaXCanada, will return home after crossing Canada in an electric car with camping trailer. Not only that, from Newfoundland, we continued on to Florida, and after a 4 month winter break, we are now returning home via California. That means we pretty much circled around 90+% of North America’s population. Fully electric. With a solar-powered camping trailer. After 6 months on the road and 20,000+mi/ 32,000+km driven, we will be on the 11am Tsawwassen to Swartz Bay Ferry. 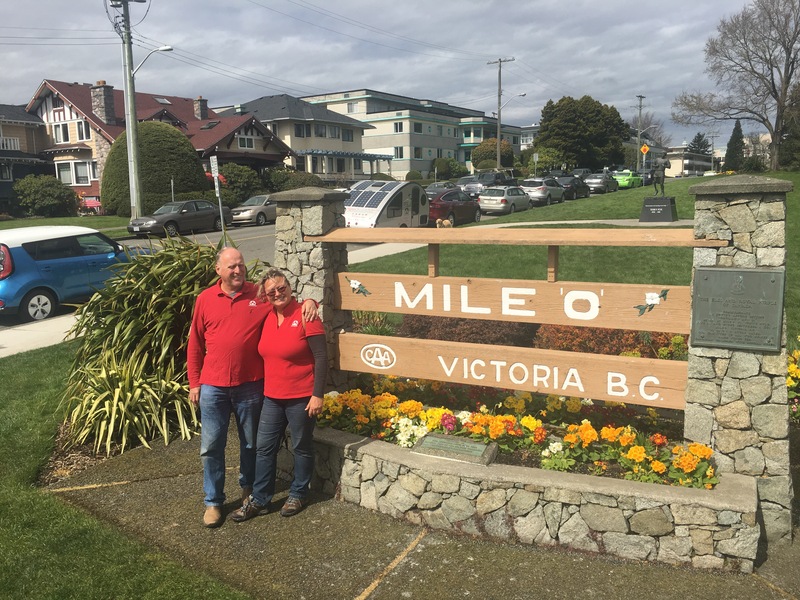 To close the loop, we’ll drive to Mile Zero in Victoria BC before heading home. 2. at Mile Zero in Victoria BC between 1:30 and 2:00pm. Regardless of the fun we’ve had, it feels good to be getting home! We’re looking forward to seeing you all again after such a long time! April 9, 2017: Redding CA to Springfield OR. Lots of driving. Some ‘fast forwarded’ Supercharger fun. Charging the car’s batteries going downhill through regenerative breaking. Kye meets a ‘bear’… Enjoy the scenery! Getting closer to home every day! Quickly visited “The Mothership”, then charged at Dublin Superchargers (SC) and Service Centre before continuing on to Corning SC via Vacaville SC. Bought some olive oil in California’s ‘olive metropolis’ and finally headed to the Best Western Plus Hilltop Inn in Redding because they have Destination Chargers. We like to support businesses that support Electric Mobility! Today, we drove from El Centro to Fountain Valley near Los Angeles CA. Slipstreaming behind a truck helped us up and down some steep hills! At the Fountain Valley Supercharger, we enjoyed an impromptu show-and-tell. Another great day!